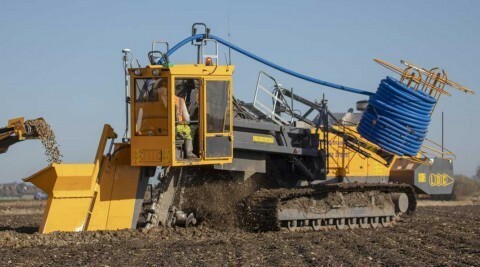 Mastenbroek’s unrivalled range features pioneering engineering for efficient, reliable and cost-effective performance in diverse sub-surface drainage applications, soil types and water tables. For more than four decades, Mastenbroek precision engineers have been at the forefront of global cutting chain technology. This pioneering work means that today, lateral and collector sub-surface drains and backfill filtration can be installed into precision on-grade open trenches. 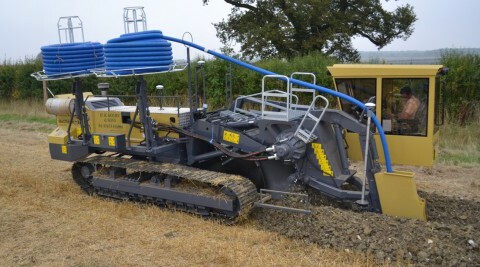 A host of industry leading features ensure that the optimum drainage scheme can be designed and installed according to field requirements, without compromise from machine limitations. From agriculture and horticulture to sports and recreational areas, Mastenbroek drainage trenchers provide the power, precision and productivity our customers rely on, no matter how tough the climate or ground conditions. At Mastenbroek we are world renowned for our expertise in the design and manufacture of self propelled trenchers and specialist attachments, and we apply the same engineering knowledge to the one-off bespoke machines we build for customers. Our most compact sub-surface drainage trencher features trench head offset 300mm left and right. 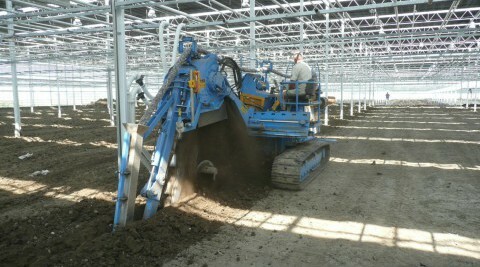 Your ideal solution for on grade trenching in restricted-access areas, such as glass houses and orchards, with laser steering for installing drains adjacent to glass house structures. 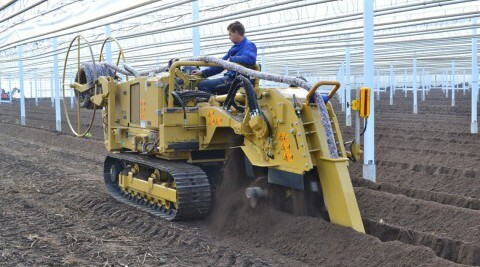 Featuring trench head offset 600mm left and right, like it's smaller counterpart the 9/12, the 10/12D provides on grade sub-surface drainage trenching where access is restricted, such as glasshouses and orchards. Laser steering enables drains to be installed adjacent to glasshouse structures. Recognised globally as the leading sub-surface drainage trencher for varied sports turf applications. Engineered for precision on grade trenching and excavated spoil removal via conveyor to leave you with a clean turf surface. Remove the conveyor system and our world-beating 10/12D Sportsfield model offers precision on grade sub-surface drainage trenching for smaller scale agricultural laterals and orchards. Built for precision performance, our combi-trencher offers on grade sub-surface drainage trenching for agricultural laterals. The optional conveyor system which removes excavated spoil adapts the model for sports turf applications. The 20/15 is a versatile on grade sub-surface drainage trencher for agricultural laterals and collectors, and cross country applications. 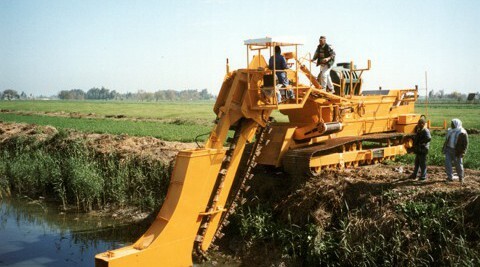 Compact and powerful, it's designed to offer you maximum productivity on varied soils. The 30/20 is fitted with two dual-speed motors to maximise torque across the digging chain speed range. The result is optimum digging power in varied and heavy soils, enabling on grade sub-surface drainage for agricultural laterals and collectors, and cross country trenching. 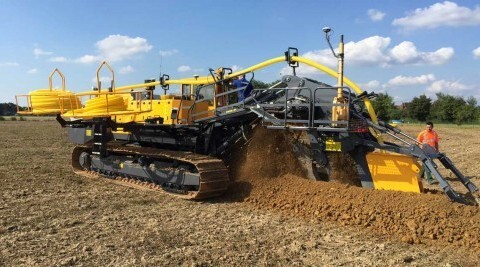 The 40/20 has been developed in response to global demand for a powerful heavy duty chain trencher which incorporates the latest technology to install on grade drainage with greater efficiency and repeatability. Maximising operator comfort, safety and staying ahead of the more stringent environmental standards in North America and Europe. Fitted with a mechanically driven digging chain via a six-speed gearbox, the M-3500 is an excellent alternative to hydrostatic chain drive when mechanical technology is the preferred option. 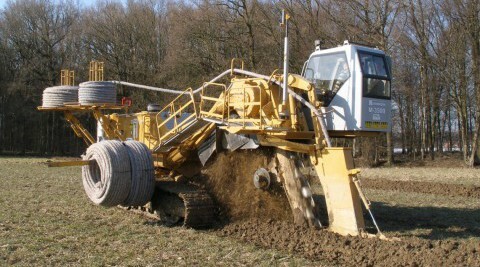 This trencher provides optimum digging power in varied and heavy soils, enabling on grade sub-surface drainage for agricultural laterals and collectors, and cross country trenching. The 36/30 and 40/36 are our larger “on grade” sub-surface drainage trenchers. 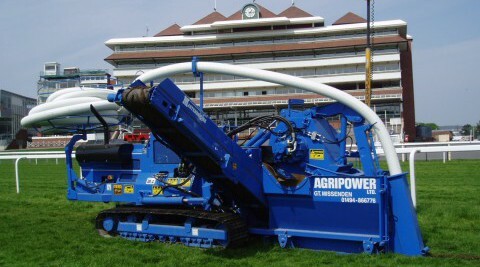 These powerful workhorses are built for maximum productivity and reliability when working with bigger diameter and deeper trench agricultural collectors, and in cross country trenching applications.